The point they’re driving home is that if we do a better job collecting, analyzing, and presenting that data, we can learn a lot about how residents move about, utilize, and experience the city. Most importantly, they want us to be more diligent in what we claim this data actually tells us so that we don’t reinforce, with physical proof, already entrenched social inequities that rely on myth or assumption. 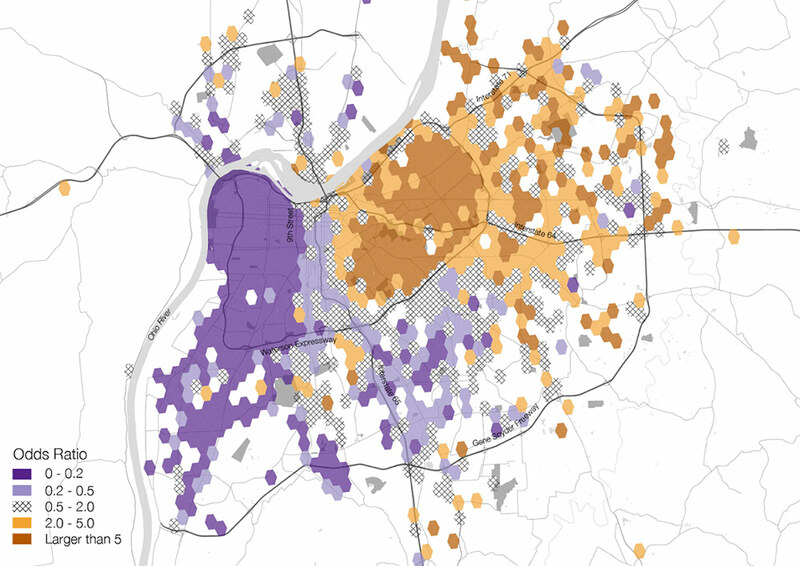 Aarian Marshall from The Atlantic’s City Lab recently took a look at Shelton, Poorthuis, and Zook’s work around measuring the myth and reality of Louisville’s “Ninth Street Divide.” Her conclusion: “The problem with Twitter maps isn’t that social media data is inherently flawed—it’s that the people who make them get lazy.” Shelton et al. 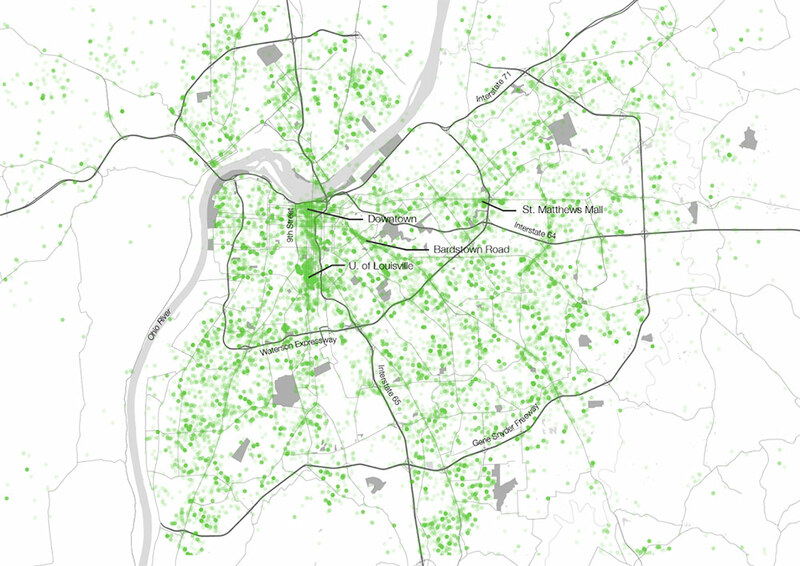 make this clear through their research by contextualizing a data set of “tweets” from different areas in Louisville. These tweets tell a much more nuanced story about how residents of West Louisville are much more likely to travel across the divide whereas east end residents are not. Twitter maps, especially those exploring the import of social equity, and inequality tweets, have been all the rage recently. This has led to some incredibly interesting, but often intellectually dishonest analyses of what we’re actually seeing. Phil Menczer was recently interviewed by Fast Company around the issue of Astroturfing: the process of masking politically minded sponsors by generating digital media content that seems to be “grassroots” in makeup. This is only one of the dangers of poorly constructed or displayed social media maps; the others lack of context, not explaining the density present in the map, and problematic sample sizes. While we wish the authors’ work would have investigated the continuing social processes that act as all-too-real boundaries between East and West Louisville, including a history of segregation, disinvestment, red lining, and forced residential displacement, their work does a lot to make apparent the porosity of the physical boundary of Ninth Street itself. It also does a lot to show that the residents of West Louisville aren’t satisfied with a xenophobic interpretation and experience of their city. This raises the question, in turn, are local urbanists investigating the right evidence when they look at the Ninth Street Divide as solely a “physical” barrier? Ought we add to our search the continued social processes around disinvestment, historical damages, and claims of gentrification in the area instead? Hi Pat! I’m not sure what you mean? Who’s efforts did you take the article as questioning? I found Ate’s article to be quite fecund. I hope that my article didn’t come off as questioning his work or the work of FloatingSheep.org. Also, I felt like it was Ate’s work that raised the question of whether or not the physical barrier of 9th street was the onus of the ‘divide’, not my own opinion. Sorry if I offended you some how.